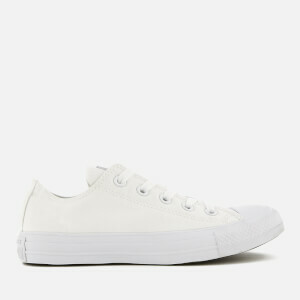 Converse Chuck Taylor All Star Ox trainers with monochrome white leather uppers. The classic low top construction features a lace fasten, rubber sole and All Star heel branding. Complete with tonal metal eyelets, a signature rubber toe cap and an All Star brand patch on the tongue. I've found these trainers really comfortable for everyday wear, as well as brilliant quality in terms of keeping their shape and being easy to clean to keep them as white as possible. Would highly recommend.